A Vogel Uva Ursi & Echinaforce is a traditional, herbal medicinal product used to help relieve minor urinary complaints associated with cystitis in women, such as burning sensation when urinating and frequent urination. This is based on traditional use only. Uva-ursi Complex is a combination of two distinctive herbs – Arctostaphylos uva-ursi and Echinacea purpurea. It is one of Alfred Vogel’s very first herbal products and used to help maintain the health of the bladder and urinary tract. 1ml of oral liquid contains the tinctures of: 715 mg fresh Uva-ursi herb and 240mg fresh Echinacea herb. 1ml of oral liquid contains the tinctures of: 715 mg fresh Uva-ursi herb (Arctostaphylos uva-ursi (L.) Spreng.) (1.4). Extraction solvent: Ethanol 43% m/m and 240 mg fresh Echinacea herb (Echinacea purpurea (L.) Moench) (1:12). Extraction solvent: Ethanol 57.3% m/m. The other ingredients used for the liquid are ethanol and water. Women over 18 years: Take 15 drops in a little water two to five times daily. Make sure you drink plenty of fluids whilst taking this product. Not for use in children or those under 18. For oral use only. Do not take more than the recommended dose. 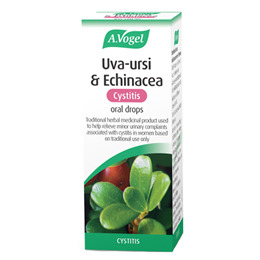 Below are reviews of A Vogel Uva Ursi & Echinaforce for Cystitis - 50ml by bodykind customers. If you have tried this product we'd love to hear what you think so please leave a review. A Vogel Uva Ursi & Echinaforce is a a traditional, herbal medicinal product used to help relieve minor urinary complaints associated with cystitis in women, such as burning sensation when urinating. This is based on traditional use only.